Description: Erect perennial herb with short rhizomes and tubers, 1.5–3 m high; stems hirsute or pubescent, branched above. Leaves ovate to lanceolate, 3–20 cm long, 5–8 cm wide, margins toothed, lamina 3-veined, upper surface scabrous, lower surface pubescent; upper leaves opposite, becoming shortly petiolate, smaller and narrower. Heads several or numerous; heads 5–8 cm diam. 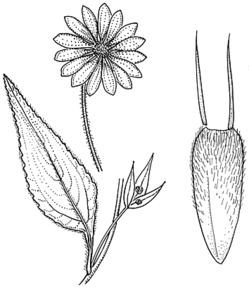 ; involucral bracts lanceolate, acuminate, hirsute or ciliate on the margins; receptacle scales acute and hairy at apex. Ray florets yellow; ligules 3–4 cm long. Disc florets yellow. Achenes narrow-obovoid, 4–6 mm long, hairy towards apex; pappus of 2–5 laciniate scales. Distribution and occurrence: A minor weed along roadsides and in wasteland near habitation, not common, possibly naturalized in the Sydney, Hay and Orange districts. Native of N & S Amer. Frequently cultivated for its edible tubers.